Welcome to Professor Sonia Pasqual online website for Introduction to Stage Lighting, Basic Stagecraft, Creative Design for Theater, Lighting Design for Entertainment, Makeup for the Stage and Survey of Entertainment Technology. This site is to be used only as an additional source of Information to the Professor's in class lecture's and or hands on demonstrations. It is to be used as an additional source of information only, does not excuse having textbook(s) or taking notes in class. The course syllabus and calendar for the current semester is available via the course homepage http://www.valenciacollege.edu on atlas via Blackboard for your particular course. You will view the course reference number aka CRN for the course. I will not be posting syllabi's on here any longer. Hard copies are available for students. Disclaimer: The information gathered on this site is produced by Sonia Pasqual. All other information has been credited to its source and is only used as a visual aid for my students. Sonia has been involved in the art of theatre and entertainment since 1992. Her knowledge and information comes from her experience and growing up in the theatre world. She has worked in theatres across the Greater Central Florida, North Florida, and New York City. Her work and experience also extends into the theme parks such as Universal Studios 97-99, and Walt Disney World 04-Present, while at Disney she has played several roles. The most exciting roles as a Disney cast member for Sonia is pyrotechnics, off course being on the Global Lighting Design Bench and working as a stage technician (lighting, video, and camera operation) for Magic Kingdom and the former Pleasure Island in the night clubs and other positions as a temp. production planner including resorts and downtown Disney boardwalk. Sonia runs her own lighting company, Sfumato Design Group, LLC where she and a talented group of designers collaborate designs, consultant and or handle the technical and coordinating aspects of the entertainment industry. Avatar Boat Ride, Walt Disney World, confirmed and scheduled to open 2017. WELCOME to Introduction to Stage Lighting with Sonia Pasqual. 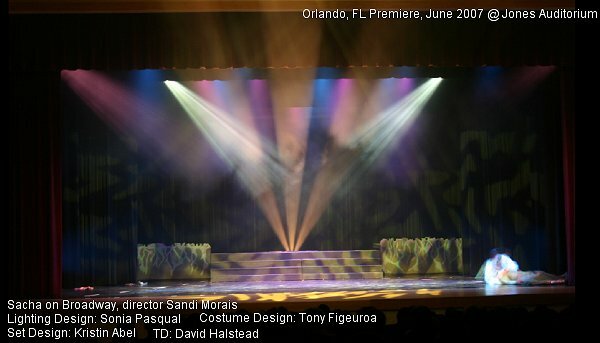 In this section you will learn the overall purpose and approach to lighting for the stage. Let us begin! Entertainment and or Theatrical lighting is used to E N H A N C E the scene. The lighting should pull all the aspects of the stage together. It is not just enough to illuminate the actors, set, costumes and props, the lighting should allow the whole piece to be embraced and supported. For example, parts of a set may need to be subdued, or certain props and costumes may need to be enhanced, and the actors must be seen in a proper relationship to their background and surroundings. Therefore, all objects that appear on the stage needs to be in balance and the light should focus in on the picture that needs to convey the sense and feeling to what the audience is viewing. The lighting should NOT, distract or be non-supportive to a scene. Only unless that is the purpose the director wants to achieve. KEY NOTE: The lighting should pull all the aspects of the stage together. Stage Lighting Revealed, page 15 of textbook - read the text information on this topic as assigned in the course calendar section of the syllabus. Material from the text, WebCT, labs and lecture will be presented in the the in class exams. 1) Selective visiblity: The #1 function of light is to see, to illuminate, to make visible to the nake human eye. The audience should see only what the director wants them to see. 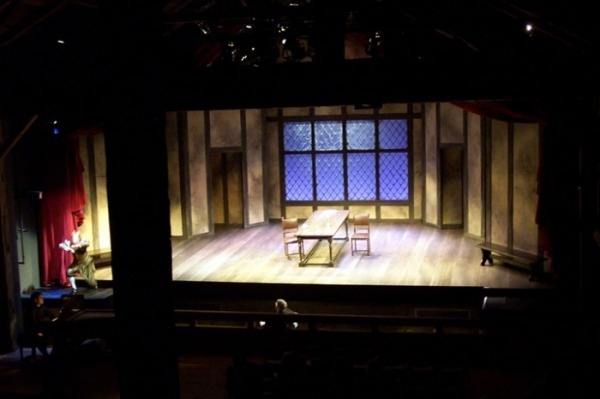 Lighting will help to FOCUS the audiences' attention through (the eye) only to certain areas, performers, props and or a set piece which may be the main focus or the emphasis in that scene. The key purpose to "selective visibility" is that the audience is only viewing one thing at a time and not everything which may cause them to miss the importance of that scene. The lighting for a production can act as a camera, as it cuts to ONLY what the director wants the audience to see at any given moment. 2) Mood: (defining a mood: a mood is triggered by a particular stimulation or event). Therefore, lighting is intended to create moods and emotions in a scene that will only reinforce that particular moment, which may include the actor, actress, and special objects as its assisting reinforcements. The mood helps to direct the audiences' emotions so that they may feel what the director's motivation of the performer to portray and or convey, through words, actions, etc. 3) Composition: The entire stage is intended to have cohesiveness relative to the scene. The lighting is intended to emphasize the flow of the story. Therefore, the lighting helps to structure and form the scene and set. The composition of the light, forms and directs the eye which manipulates the thoughts of the mind and set the picture of that scene. The composition therefore creates the entire perspective and forms an overall perception by using light. 4) Revelation of form: The lighting is intended to make the performers, scenic elements and the props appear three dimensional against the other set pieces and the overall background. Revelation of forms uses light to allow the performer, set and or objects to be ENHANCED or accentuated. The enhancement can be in its natural form or in an abstract way (depending on the director's vision). To reveal the form of a character is to help accentuate (emphasize or to intensify) its body (shapes, curves, non-curves) in order to be appealing, grotesque, taller, shorter, wider, the desired look. The purpose of revelation of form is to SHAPE an object with light. 5) Reinforcement: This function of lighting is to help the theme or purpose of the scene by using light that contribute to the overall feeling or mood. By reinforcing the theme the lighting is supporting what the scene is trying to convey to the audience. EXAMPLE: Photo demonstrates - Revelation of Form revealing the form of the model and her clothing, Composition as the eye is directed to the model, her figure and surrounding environment. The lighting from above the water acting as a back light adds to the reinforcement of drama and yet floaty airy feel of this photo, which also the colors helps to define. 1) Color: Color is the key to creating the mood or directing the emotion of a scene. The use of hues and saturation in the stage lighting helps to convey what is going on, about to happen, and or to redirect the emotions of the audience. * (In textbook the color is part of what creates Form - - the variety and contrasts in both intensity and color when it is used throughout a scene, found on page 15). 2) Intensity: This is the amount of light or brightness that is transmitted by the light. 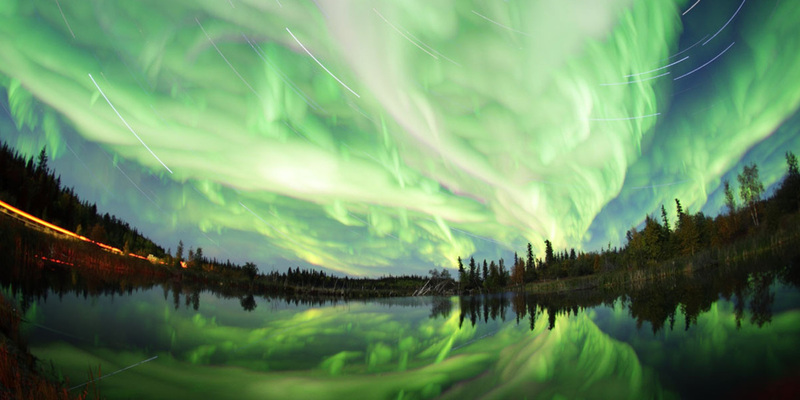 The intensity can range from a dim glow to an explosion of light. This is what gives theatrical lighting its dramatic effect and look. For example, think about you are trying to see a romantic mood on stage. In most theatre's for safety reasons using real candles is a no no. So the set a romantic seen you will not have the stage lighting at 100%, all bright, as that does not set the mood for romance. 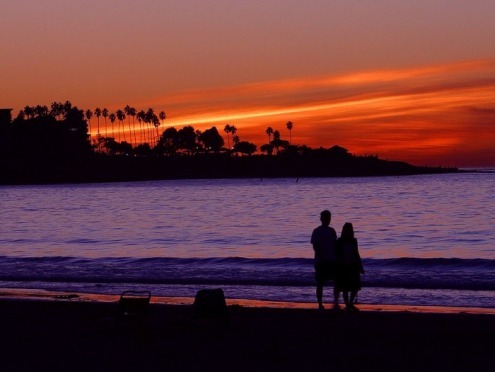 Using the light at 35-40% a lower intensity can more set the mood for a romantic scene. Especially, if you are using colors such as varying hues of pinks to light reds. * (In textbook the color is part of what creates Form - - the variety and contrasts in both intensity and color when it is used throughout a scene, found on page 15). 3) Distribution: The physical location of where the instruments are placed. This also relates to how many instruments are being hung, the type of instrument used and the instruments beam size. The location of the instrument placement is important to how the light will illuminate an object. So placing the light at an appropriate angle and location will effect the way it cast light on to the object, helping to shape the object and create more drama or less drama (depends on what is needed). 4) Movement: All of these other properties can be intensified or diminshed with the introduction of movement. Movement implies that a CHANGE is taking place either sublty or quickly. We now also use moving (automated, intelligent lights) to create a feeling of excitement in a dance club of concert setting. However, movement allows the eye to be redirected or move around affecting the physical senses through the eye and allowing the light to set the mood (be it excitement, drama, comedy, tradegy or horror!).
" Stanley McCandless was perhaps the first to define controllable qualities of light used in theater. In A Method for Lighting the Stage, McCandless discusses color, distribution, intensity and movement as the qualities that can be manipulated by a lighting designer to achieve the desired visual, emotional and thematic look on stage." I DO EXPECT YOU TO USE THE ABOVE INFORMATION FOR DEVELOPING YOUR LIGHTING PORTFOLIO! EXAMPLE: Photo demonstrates - Selective Visibility, Composition, Color as the eye is directed to the model, the surrounding environment is enhanced by lighting how it hits the fog, yet adds to reinforcing the mysterious sexiness of the model. Lighting Positions consist of 5 main positions of lighting an object on stage. There is definitely more lighting positions. As an introduction to lighting, these 5 position covers enough for informational purposes. (To learn about positions or lighting design, the lighting design class is offered every Fall at VCC). 1) Front Light- The key and fill light is the primary lighting source in a scene. It represents the motivating light source for a specific area or scene on the stage. Front lighting involves a method of light referred to as McCandless Theory of lighting, this theory was developed by Mr. McCandless in order to properly light an object/actor by the means of light mimicing natural daylight. McCandless theory involves the light source projected from a front position at a 45 degree angle, one light should be warm (to mimic the sun's light, while the other light should be cool to mimic the sky). This depection of lighting the performer using natural light and McCandless theory eliminates any possible shadows from the faces, which will cause proper lighting and not distract the audience so that they may focus on the dialogue and action of the character(s). FYI FILM LIGHTING: In film lighting this form of front light is referred to as key and fill lighting. Fill light is used to help REDUCE and SOFTEN the shadows. The fill lights usually are set at about 50% of the intensity of the key light. Different colors can also be used in the fill lights to help contribute to the mood of the scene. 2) Side Light - Side lighting is used to accent the side of the face, arms, mid-torso, legs down to the shin of the body. The movements of the performer is highlighted from a direct side light source. Full side lighting is composed of shin light (bottom), mid torso (middle) and neck to head lighting (top). The lights are mainly used to reveal form of the body, and is used to enhance the performer, especially dancers. 3) High Side Lights - this light is from an over head and at an angle of 30-60 degree angle approximately. This form of lighting is to accentuate the top side of the head, neck, shoulders, arms and mid torso. High side light is used as an additional form to objects/actors. It is also used in dance lighting to help shape the form of the body from another perspective angle. High side left and high side right light for completed high side lighting on a performer. 4) Back Light - is used to help the performer or object to be separated from the background and not blend in. Back light also shapes the performer and or object so it is individualized and reveals its natural form. Back lighting creates a depth which makes the performer become more three dimensional. This will also help pull the performer out from the scenery or backdrop. 5) Down Light - is used to sculpt the top of the head, shoulders and adds light to the form if it is extended or wide. Down light is great for washing an area on stage by the means of covering that area with light coming straight down from the top. Down light is mainly used to wash or flood an area on stage with light in a soft or harsh manner. The proscenium arch evolved from the "proskenium" in Ancient Greek theatres, 17th-18th century. This was the space in front of the skene or backdrop where the actors performed. Stage floors were RAKED upward slightly from the front to back, in order to contribute to the perspective illusion, and also made the actors more visible to the audience who were at the front row seats which was on the flat floor level. This then changed to reflect the audiences seat to be raked instead and the addition of balcony seating was created to give the audience a fuller view of the stage and its performance. It derives from the Greek proskenion, meaning "in front of the scene". The scene was a building with doors that served as the backdrop in Ancient Greek theater. The proskenion was a raised stage in front of Hellenistic era and in Roman theater; it served simply to make the actors higher to aid visibility, and to separate them from the chorus. Ancient theaters thus lacked the modern proscenium arch. It was also absent from Renaissance theaters. The proscenium arch developed in seventeenth century theaters, alongside the development of illusionist scenery. This design has been the most common for theater spaces in the 18th, 19th, and 20th centuries in Western theater. Theatre in the Round and or an arena style theatre simply means that the audience surrounds the entire stage. The stage itself is in the middle of the venue and the performance and performers are on the stage. The entrance and exits of the performers may be through the isles of the house in which the audience is seated, unless the stage is built in a fashion where it is raised from a lower ground level and raises up to the audience level. However, most traditional spaces that are theatre-in-the-round is static and does not move up or down. This space does force all entrance and exists onto the stage through the audience, unless they are raised up or flown down onto the stage by the means of a pulley system or some high tech gear. Thrust Stage: Used for centuries from Greek to Roman Theatres! 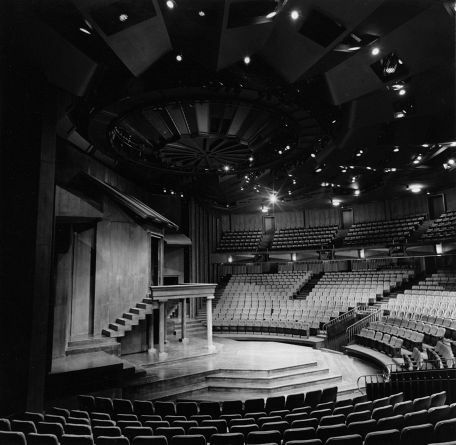 The first thrust stage was used back in the 17th century. The ancient Greek theatre was set in the outdoors, using the natural light of the day and night to set the scene. Ancient Greek theatre and Roman theatres used thrust style stages as it allowed the audience to be seated mainly around the stage on all but one side of the stage. The ancient form of theatre mainly used the characters, dialogue and props to convey the message of the scene on stage. It was not until the development of the proscenium stage was more so scenic and set elements became more widely used. On a thrust stage the audience can view from three sides. A proscenium stage can be transformed, with a project platform extended outwards towards the audience to create a thrust staging. Fashion shows use runways or a thrust stage style for the models to walk down the runaway so that the clothing may be viewed in a more initimate and overall setting. There are limits to what can be done on a thrust stage, as you can not use certain elements that will block the view of the audience, this is very similar to theatre in the round. Certain set elements can not be used if it will obstruct the viewing of an important thing to the audience. The black box theatre is a space that is flexible in seating and allows the director and design team to create the space as they would like too. The black box space is a room usually shaped in a box style, the walls are painted or draped in black and seating is definitely not permanent. In this space the floors and walls can be painted to reflex what is the desired need of the play. The dimensions of the black box can vary tremendously, I have seen large spaces to a small initimate space, either way the space allows for an initimate setting where the audience is close and almost feels like they are a part of the show. In the black box theatre the above theatrical stages can be easily reproduced, as the black box can be thought off as a blank canvas. In the black box/ flexible space, the director depending on the effect that he or she wants to have on the audience can create a stage that is theatre in the round, thrust, or proscenium. Building a set, using drapery, platforms and etc will help to create the space desired. The black box theatre I have seen referred to 'experimental theatre' there are other types of flexible spaces, that I will discuss more below. The flexible spaces allows mainly to as a source of working with varying types of budgets. I have seen some wonderful, if not the best performances in a flexible space. As the main essence of the performance dealt with great, passionate, talented performers and a minimal of set and lighting used. "Black box theaters became popular and widespread particularly in the 1960s and 1970s. The black box theater is a relatively recent innovation consisting of a large square room with black walls and a flat floor. The seating is typically composed of loose chairs on platforms, which can be easily moved or removed to allow the entire space to be adapted to the artistic elements of a production. Such spaces are easily built and maintained, and are usually home to plays or other performances with very basic technical arrangements, such as limited sets, simple lighting effects, and an intimate focus on the story, writing, and performances rather than technical elements. The older black boxes were built more like television studios, with a low pipe grid overhead. Newer black boxes typically feature catwalks or tension grids, the latter combining the flexibility of the pipe grid with the accessibility of a catwalk." Flexible Spaces: Creating a stage for an event! Flexible spaces are appropriate when it comes to a special event. Most flexible spaces do not have what is needed for creating a stage and therefore a lot of pre-production work has to go into getting things organized. For example, in order to do an event you must have the elements that are needed for the success of that production. Your client/director/production designer and managers will let you know what's their vision. Then with your accumulated expertise you begin the process of doing research on the space dimensions, what is available, what works, how they work and most important what is needed. The rental companies get great business as you will need to rent lighting, audio, video, staging, drapery, power supply, flooring, decoration, set pieces, and what ever may be needed for the event. Flexible spaces are some of the following: Ballrooms, Open fields, Convention Halls, Malls, and practically any space that you can set up gear and staging. The lighting portfolio is a project done to help the student understand the basics of stage lighting's qualities and functions of light. This is important as a function not only to stage lighting but lighting in general. 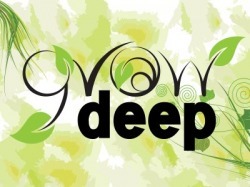 We use to 'see' everyday, opening one's awareness to how it functions and its qualities are vital. The assignment is natural, artificial, LED/projection and special effects lighting. Three photos of each will be required, in color, no photo should be smaller than 4"x6" or larger than 5"x7". A brief (short paragraph - 4-5 sentences the least), clear and understandable description of the qualities and functions of light that is shown in your is presented in your photo. NOTE: keep in mind that you are picking these photos, do not pick a picture that is so difficult you can describe at least 3 out of 4 qualities or 4 out of 5 functions of light. The purpose of this project is to become aware of the applications of lighting, whether it be natural, artificial, l.e.d's, projection/special effects. Use the above photos, listen to the class lectures so you have a better idea of what the project entails. Below you will find the document to facilitate the lighting portfolio project. Click on the download file to retrieve the document and or ask for a hard copy in class. However you should have no problem downloading the file. The file gives all the elements that is needed for development, grading and presentation in class. File download is being updated and will be uploaded soon.